Apparently all you need to do is blog about missing an item, and then it will drop. Like the Left Binding from Baron Geddon, which was the last of the really rare parts of the Thunderfury legendary collection mini-game. 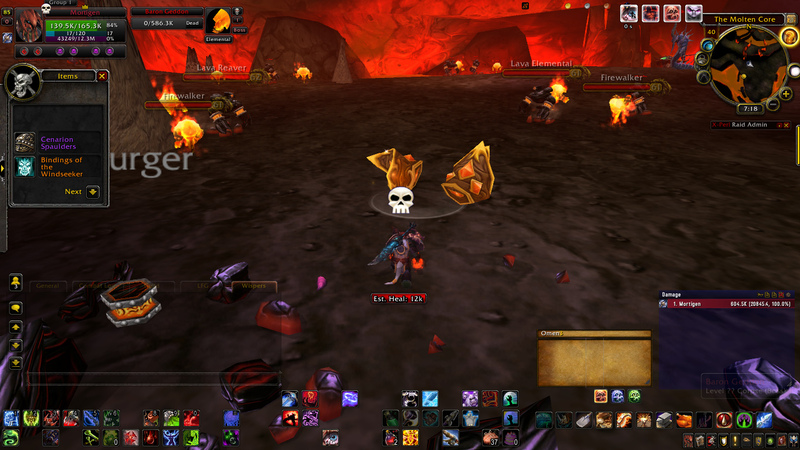 After that post I mauled my DK through Molten Core yet again, but this time the damn binding dropped! I literally took my hands of the keyboard and paused for a good few seconds in disbelief whilst staring at the screen when it happened. And then mashed the print-screen button to get some proof in case of emergency roll-back. I’m stoked! Now I need to gather some enchanted elementium bars and/or their mats, which most of which can be purchased cheaply. Then its off to bug central to slap a boss around until he makes with the sword drop. So some grinds and a few odd quests and the weapon is acquired. I’ve not been as keen to play wow as I am now for well over six months. This entry was posted in Warcraft and tagged left binding, legendary, rare drop, thunderfury by Typhoonandrew. Bookmark the permalink. Wooooooooooooot! GRATS! I think you’ve been grinding for this since I first met you haha.